Questions? Comments? Just wanna chat? Feel free to drop me a note at genuinemudpie [at] gmail [dot] com. glad you like the cake slice, renee! feel free to send me a note if you need any clarification for the pattern! happy crafting! Love your tutorial on how to make a fish from plastic, ideal material for it, recycling too! I had a white and red fish who was similarly ill fated when I was little. Love your site, keep up the good work! thank you for visiting, Houston! sorry though, i’d like to hold on to the $5 coin. all the best with your search! it doesn’t take much… if you have half a skein of each colour it should be enough. hope that helps! Oh my what cute stuff u make wish u lived near me so we could hang out & put our heads together on crochet & crafting.I teach beginning crochet and jewelry making at a local cafe. My daughter found your plastic crochet fish & sent it to me I just finished it tonite was the cutest little fishy ever! She want several & will be hanging them about her bathroom. Love the recycle idea are u on pintrest if not please add some of your cute things out there for others to share! Such talent u have my friend keep it up! thank you so much for visiting, mona! 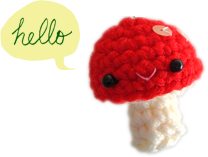 it is so cool that you teach crochet — i wish i could do that someday! i’m not on pinterest… yet! :D will surely let everyone know if i decide to get on it! You’ve inspired me to go to crochet classes, and buy some air plants! Don’t ever stop updating your blog, you have so much talent. I downloaded Episode 1 and 2—question: are there more episodes ? If so, where are they? I’m sorry–I’m just getting used to your website and your creativity! I know you must hear it all the time, but they are so cute! thanks so much Hiromi! there are only two sushi episodes so far, but there could be more in the future if i come up with more ideas! all of my patterns are in the “tutorials” section of the blog :D happy crocheting! today I saw the toasty blanket …I just had to smile..what a cute idea and I learned you are a punster! I’m interested in your plush clutch and was wondering if you’re recently making those and sell it? Please let me know!! Thanks for visiting Alexandra, and thank you for your interest in the plush clutch! I no longer make it for sale though. Sorry about that! My name is Nathan Hoffman and I’m the Partnerships‐Manager at FindMediaPartners.com. Thanks in advance for the Details Trish !